"I no longer find my identity in my music anymore." 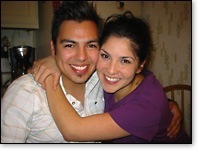 Contemporary Christian Music (CCM) artists Jaci Velasquez and Nic Gonzalez recently gave this joint interview to Christian Music Today. Velasquez is a popular CCM solo artist, and Gonzalez is the lead singer of the band Salvador. The two married on December 17, 2006, and this interview focuses on how their relationship so far, dubbing them as "young Latin lovers." The couple lives in Nashville and gave birth to a son, Zealand David Gonzales, on November 3, 2007. Jaci, you've been at the top of the charts for a long time and a favorite in Christian pop. Have the aspirations changed for you now that you're a mother? Velasquez: My career, my ministry is all important, though I no longer find my identity in my music anymore. My identity is now in my relationship with God and my two boys. That's what I love the most, though I still love making music. And Zealand loves me making music—[I could tell when] he was in my tummy making the [latest] record. He would wake up in my stomach, and to soothe him, I would have to sing. He would also get really upset if someone was singing off key on the TV or something. So I'd sing to him and it would soothe him and he'd listen to me. Now he's still the same way—when his mommy or his daddy sing, it soothes him. It's really sweet. It made for a different experience making a record, putting things into perspective. It used to be that I would remember what was going on in my life by the record that I was doing at the time. The reality of it was [my life] was only based around that. Making music is a big part of my life, but it's just not my life. Nic, you're a lifelong Austin boy. What was it like making the move to Nashville? Gonzalez: I don't want to speak ill of Nashville because it's a good city, but it's not Austin. My wife lives here, and I love my wife, so that made it easy. It was easier for us because we both have careers here and she just happens to have a couple of things going on a little bit more than I do. I was able to live in Austin to hide away from all of it, but Jaci's face is a little more identified with this area. She works more out of here, so it only made sense [to make the move].